Not sure what you want? Just need to supplement your stash for upcoming projects? Maybe you should buy some remnants. Sold by the pound with a minimum of 1 pound. 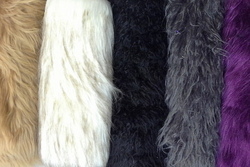 You will get an assortment of fake fur pieces-- different styles, colors, textures. No piece will be smaller than 9"x15" and none will be bigger than 15"x60". You will not get duplicate pieces of the same fur. This offer is only available for orders that are shipped. NOT available in store.